Hanoi (VNA) - With their solidarity, the ten small and medium Southeast Asian countries have done what many countries in the world desire to do but are unable to achieve, said Deputy Prime Minister and Foreign Minister Pham Binh Minh in an article marking the 49th anniversary of the Association of Southeast Asian Nations (ASEAN). In his article, also marking the first ASEAN Day since the ASEAN Community (AC) took shape last year, Minh said the formation of the AC, the first body of its kind in Asia, has become a milestone of regional connectivity. He noted that the AC was formed in the context of complex global events, "as waves of extremism, terrorism, conflicts and uncertainties rise" not only in hot spots like the Middle East, Africa and South Asia, but also in Europe and America, which were traditionally considered peaceful. Against this backdrop, Minh juxtaposed the peace and stability in the region maintained thanks to "the endeavours of each member country as well as their concerted resolve and efforts." The AC has been striving for comprehensive integration in politics, security, economy, culture and society, and since its historic founding, ASEAN member countries have come closer to each other and harmonised their own interests with regional ones, Minh wrote. The benefits of intra-bloc cooperation - which Minh dubbed in "the three Ps of Peace, Prosperity and People - have been borne out by almost 50 years of partnership. Although the ASEAN Vision 2025 was only launched in January 1, 2016, it has already logged encouraging achievements, according to Minh. - On the politics-security pillar, 140 out of 290 action lines set in the ASEAN Blueprint 2025 have been implemented effectively, highlighting the group’s strength in promoting dialogues and building trust and codes of conduct. Therefore, despite complicated regional developments, especially in the East Sea, cooperation mechanisms led by ASEAN such as the ASEAN Regional Forum (ARF), the East Asia Summit (EAS), the ASEAN Defence Ministerial Meeting Plus (ADMM+), ASEAN+1 and ASEAN+3 have been important frameworks in maintaining peace, preventing conflicts, promoting cooperation and boosting development. - Economically, amidst the sluggish global economic recovery, ASEAN’s economy is forecast to continue to grow at about 5 percent annually in the next decade, nearly doubling the world’s average. The formation of the AC has turned ASEAN into a united entity, the third largest economy in Asia and the seventh largest globally, which is expected to reach fourth place in 2050. Notably, although global foreign investment dwindled by 16 percent in 2014, the capital poured into the region has increased over three consecutive years, raising ASEAN as a bright spot in the global map of foreign investment attraction, Minh wrote, adding that a market of 635 million people and GDP of over 2.6 trillion USD is expected to make ASEAN a promising destination for foreign investors. - In terms of culture and society, Minh expressed hope that with the “people-oriented” and “people-centred” motto, benefits afforded by the AC could be mirrored in all areas, ranging from education and culture to tourism, environment and social welfare. He praised the importance that ASEAN attaches to sustainable development and climate change response, as a demonstration of the group’s farsighted vision for a better future for generations of ASEAN citizens. "Against the gloomy global panorama, the AE has emerged as a bright spot where the everlasting values of cooperation, dialogues and integration were affirmed," he said. "These above-mentioned successes have not only proven the soundness of the path consistently pursued by ASEAN over the past half a decade but also consolidated ASEAN member countries’ resolve to reach a brighter future via connectivity and integration." The deputy PM noted that no regional organisation has as many achievements in attracting strategic interventions for common peace, stability and development and the AC has elevated ASEAN’s strategic position and values while continuing to contribute to balancing interests of all big countries in the region and promoting ASEAN’s central role in the regional evolving architecture. ASEAN’s special meetings with its important partners like the US, Russia and China also manifests the bloc’s increasingly significant role. "The upcoming ASEAN Summit, together with the ASEAN Foreign Ministers Meeting (AMM-49) last July, will continue to reassure ASEAN’s prestige and special mission in creating a shared playground and rules of the game for partners both in and outside the region," Minh wrote. To date, up to 86 partner countries have sent ambassadors to ASEAN and the bloc recently agreed to join the Treaty of Amity and Cooperation (TAC) of Chile, Iran, Egypt and Morocco, and is considering other proposals. "The fact that many countries have wished to expand and deepen their ties with ASEAN, and many others outside the region have expressed their hope to establish partnerships with the group, also affirm ASEAN’s supre-regional role and position," Minh noted. ASEAN has put aside its own interests to raise its strong voice on issues of international concern, particularly those regarding cooperation, sustainable development, anti-terrorism, climate change response, natural disaster mitigation and disease combat. Minh remarked that ASEAN has been known for its “unity in diversity”, mainly attributable to the intra-bloc solidarity, especially its capacity to overcome differences between member countries. But, he added, "Recent complicated developments have raised doubts about the bloc’s solidarity and consensus. Now, more than ever, ASEAN member countries need to join hands to carry forward the group’s centrality and consolidate their solidarity to protect their shared and legitimate interests." One of the most important and durable foundations for real benefits of a nation is that the nation’s benefits need to have the harmonious combination and relevance with common healthy goals and legitimate benefits of the region and the world, he noted. At the recent AMM 49, the strength of unity was proved as it swept away impediments sparked by differences and outsiders’ influences. With tireless efforts, patience, and a mindset that respects mutual benefits, the joint communiqué and the six-point join statement of the ASEAN Foreign Minister on maintaining peace, security and stability in the region reasserted the basic principles of the bloc’s cooperation that are grounded on the respect of international law and the will to work for the common Community. This illuminated that for the common destiny and interest of the 10 ASEAN member countries are always bigger than their differences. Solidarity and consensus are typical values and basic principles of ASEAN that each member country is responsible for preserving, he added. 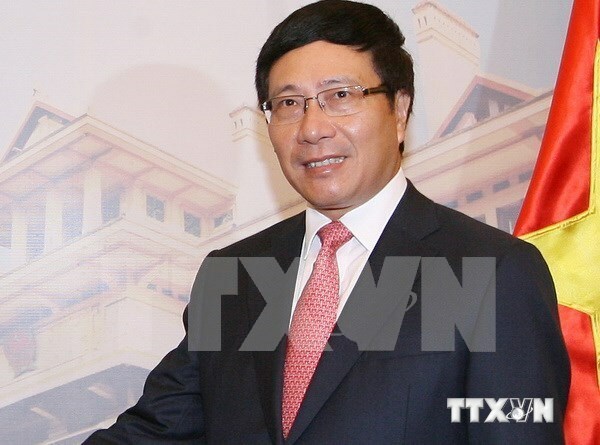 Minh noted that the building of the ASEAN Community occurred concurrently with Vietnam’s implementation of the 12 th Party Congress’s foreign policy, which regards ASEAN as a strategic priority. "Vietnam’s destiny is associated with that of ASEAN, which serves as a bridge linking Vietnam with the region and the world and contributes to establishing the country’s current position. ASEAN is also a place where Vietnam displays its stance and calls for international support of issues of the country’s concern," he wrote. In economic terms, ASEAN is Vietnam’s third largest export-import market, which gathers up to six out of ten free trade agreements (FTA) Vietnam signed with foreign countries. Thus, ASEAN helps Vietnam take advantage of cooperation with other member nations to serve its socio-economic targets and eye regional standards in such areas as education, tourism, healthcare and labours. In response, Minh remarked, Vietnam has exerted all-out efforts to contribute to the group’s success and take on all responsibilities, showing itself as a prestigious, proactive, dynamic and responsible member in the common house. He suggested that more investments should be injected into resource development and communications in order to bring the ASEAN Community closer to each local citizen and business. With a look to the future, Minh said that despite "a galaxy of difficulties and challenges ahead, with experience from the past 50 years, ASEAN has enough confidence and momentum to overcome these hindrances to continue building a community of strength and solidarity."